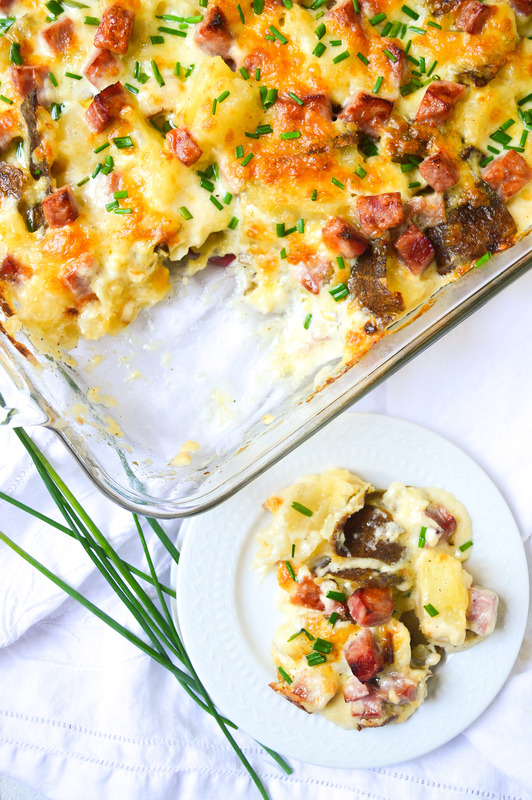 Always say yes to a brunch that includes scalloped potatoes, especially twice baked scalloped potatoes. 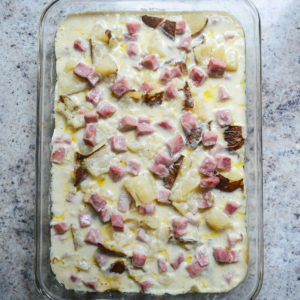 Really anything with a combo of cheesy potatoes, cubed ham and cream sauce would make a perfect addition to not only an Easter brunch, but any meal any time of day. I made these to go along with a big stack of pancakes, but we are having some again as Easter dinner’s side dish. 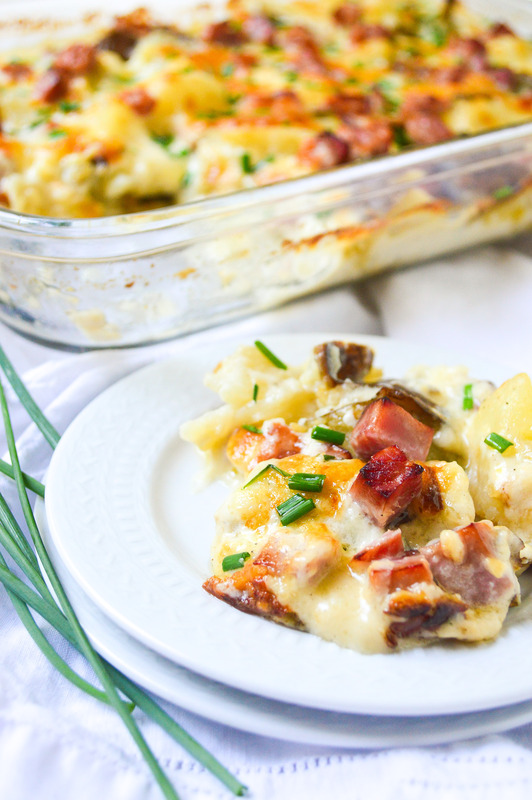 These potatoes are ridiculously good. 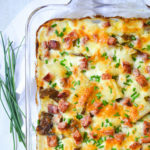 I knew right away that this was going to be my new favorite scalloped potato recipe, not only because it won everyone over after just a few bites, but because of how easy it was to prepare. I don’t enjoy having to thinly slice up a whole bunch of potatoes, or even arranging them in layers in a casserole dish. 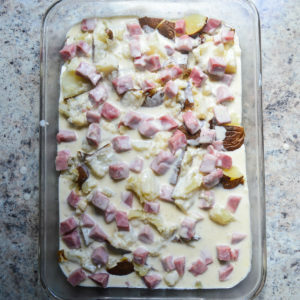 With this recipe, since it’s twice baked, all we’re doing is adding some cut up baked potatoes into a baking dish, topping with some ham and a lick-the-spoon-good cream sauce, and of course some white cheddar cheese. 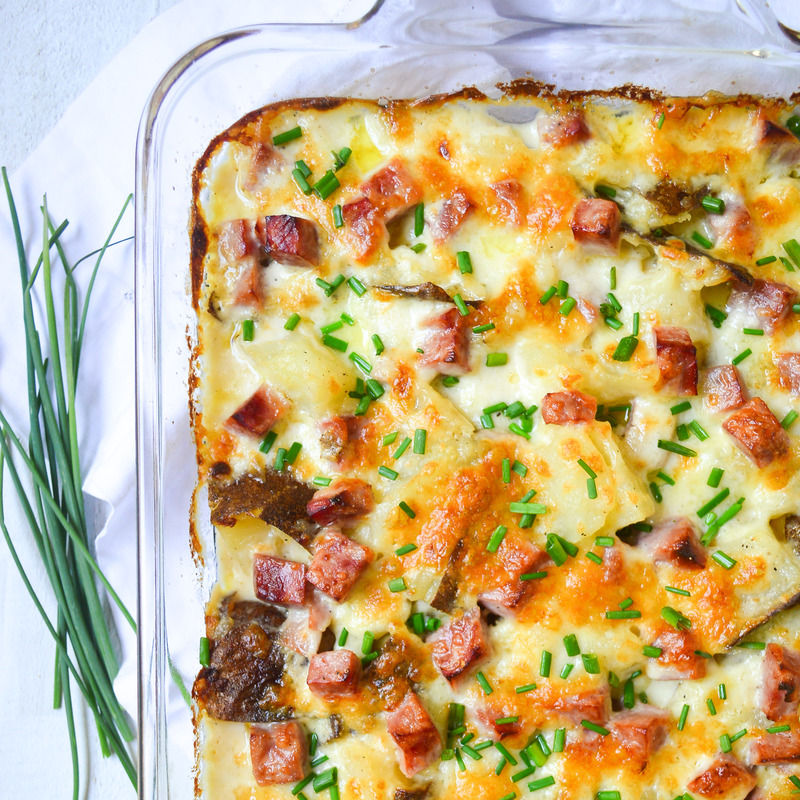 Then everything gets baked together while the potatoes absorb all that rich, yummy sauce. Top with some fresh chives, and dig in! 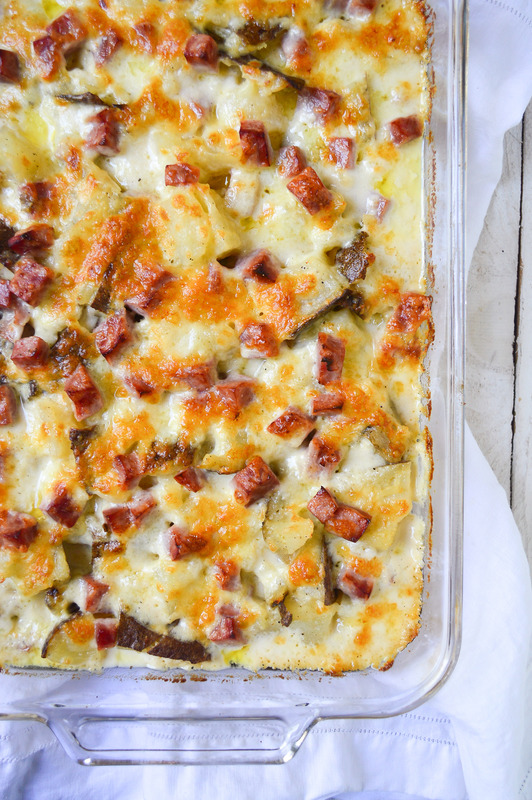 I’d say this dish is worthy of a special occasion- and on special occasions we don’t pay much attention to calories. 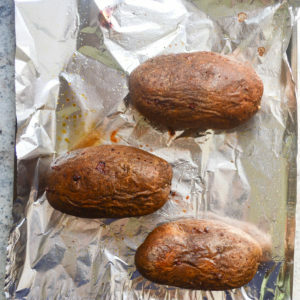 Heat your oven to 350 and line a baking sheet with aluminum foil. 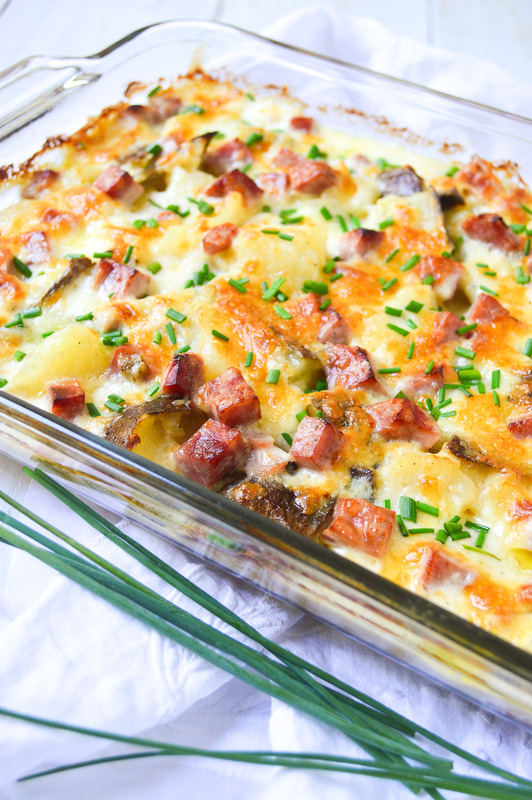 Use a fork to poke the potatoes multiple times on all sides. Place the potatoes on the baking sheet and bake for 25 minutes, then brush the outsides with olive oil and sprinkle with salt. Place the potatoes back on the baking sheet, upside down so they can cook evenly on both sides. Return to the oven and cook for another 20-25 minutes. Check doneness by giving them a squeeze (using an oven mitt!). Use a small knife to cut a slit down the middle of the potato and let it cool slightly. 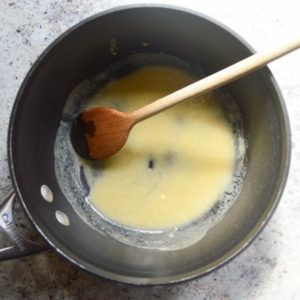 While the potatoes are slightly cooling, you’ll want to make an easy roux. 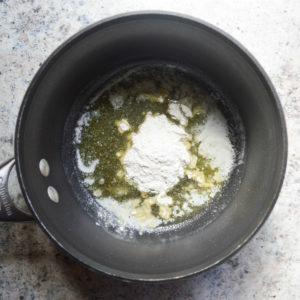 Melt some butter in a saucepan and stir in some flour until thickened and fragrant. 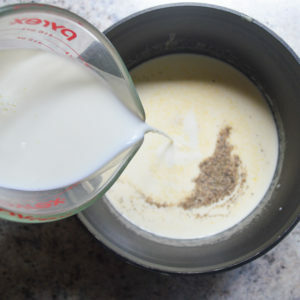 Add in the heavy cream, milk, salt, and pepper. Stir and cook until slightly thickened, about 10 minutes. Cut up the potatoes (I like leaving the skin on- up to you! ), and place them into a greased baking dish. Add in some cubed ham. 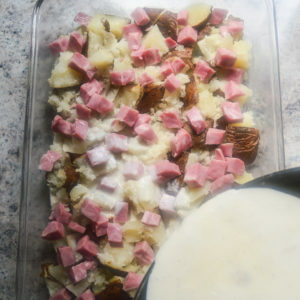 Pour the thickened sauce all over the ham and potatoes. 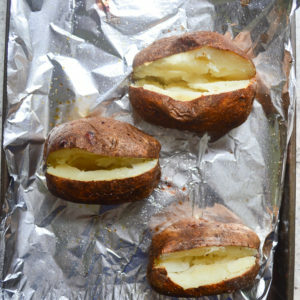 Cover with aluminum foil and bake at 350 for 40 minutes, or until the potatoes have absorbed some of the sauce and are hot and bubbly. Sprinkle with some white cheddar cheese. Gruyere would work exceptionally well here too. Place back in the oven for another 10 minutes, until the cheese is golden brown and bubbly. Sprinkle with some chopped chives. The potatoes will continue to soak up the sauce as they cool. 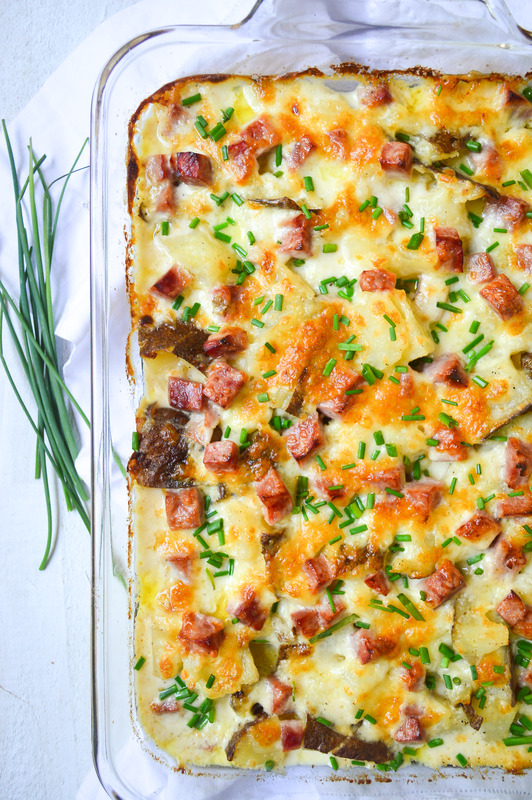 Twice baked scalloped potatoes baked with cubed ham and a rich, creamy sauce, all topped with white cheddar and fresh chives. Preheat oven to 350 and lightly grease a 3 quart baking dish. Set aside. 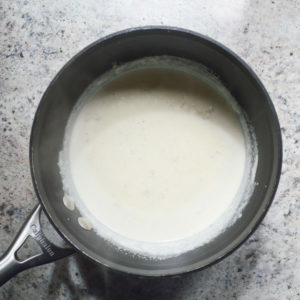 In a medium sized saucepan over medium heat, melt the butter, then add the flour and cook, stirring frequently, for 1-2 minutes. 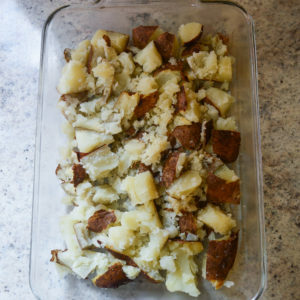 Meanwhile, cut up the baked and cooled potatoes and place into the prepared baking dish. 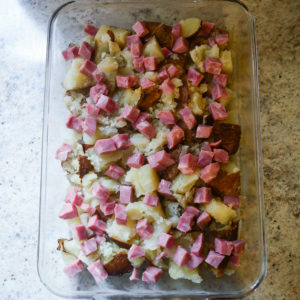 Add in the cubed ham and pour the thickened sauce over the top. 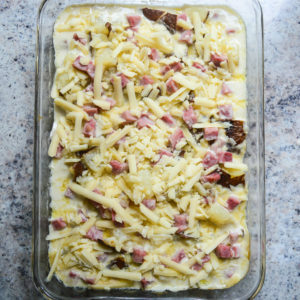 Cover with aluminum foil and bake for 40 minutes, or until the potatoes have absorbed most of the sauce and are hot and bubbly. Remove the cover and sprinkle with the shredded cheese. Place back in the oven and cook until cheese is golden brown and bubbly, about 10 minutes. Remove from the oven and sprinkle with chives. Let cool for 10 minutes before serving.